Analyzes crankshaft web deflections to prevent failures. WebMap is a computer program to analyze crankshaft web deflection. WebMap is based on original development work by Ray W. James, P.E, PhD, with further development by Southwest Research Institute's Mechanical and Fluids Division (MECFE) and Culverson Software for the Gas Machinery Research Council (GMRC). The use of crankshaft deflection measurements to assess the alignment of large stationary engines is common practice in industry. At best, these measurements are tedious and the analytical tools to collect, view, and process the data have been generally lacking. 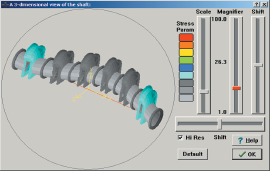 The WebMap software program was developed by SwRI and GMRC in 1992 to provide simplified input of crankshaft geometry and the systematic collection of the web deflection measurements. Web deflection measurements taken from all throws of a reciprocating machine can be used to infer displacements of individual journal bearing centers from their true end-to-end crankshaft centerline. These measurements can then be stored and retrieved for analysis, trending, and simplification of later measurements. Once collected, the raw data and shaft deflection may be viewed in tabular or graphical form. The user may then make trial adjustments (when needed) to the model to develop the adjustments necessary to realign the crankshaft.